Four-time All-Ireland winner and 11-time All-Star Cora Staunton. CORA STAUNTON HAS well and truly closed the door on a return to the Mayo set-up and ruled out an inter-county comeback, as a decision on her AFLW future looms. The four-time All-Ireland champion had previously conceded that she was unlikely to return for a remarkable 25th senior season, but has strongly reiterated her sentiments from her Greater Western Sydney (GWS) Giants set-up, saying that her ‘Mayo days are done’. 37-year-old Staunton, who has just finished her second season Down Under, was one of 12 players to leave Peter Leahy’s Westerners in a highly-publicised walkout last summer. The row rumbled on and on with her club, Carnacon, removed from the Mayo championship in the fallout. The 2017 All-Ireland club champions were later reinstated and went on to win it, but were beaten in the Connacht final. 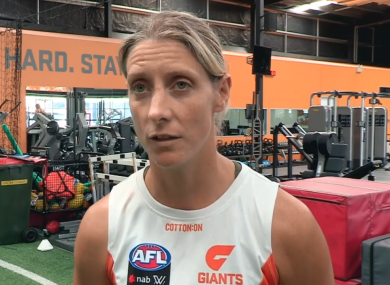 Staunton has enjoyed another season in the AFLW and is open to a third, while her focus will switch solely to Carnacon upon her return to Irish soil. “I’d be the type of person who says never say never alright, but my Mayo days are done certainly,” she told Jerome Quinn for Ladies Gaelic Football. “I’ve had 24 seasons playing with them, it’s quite a long time. Lucky enough, I’ve played for that length of time practically injury-free. The 11-time All-Star added: “It’ll be back to club when I get home. When the season finishes here, I’ll take a little bit of time to rest the body. “It’s been a long two or three years so I haven’t had a break. All my focus will be on Carnacon and hopefully win a 21st county title, try and get back to win another Connacht and who knows after that. Likewise, she’s keen to continue her journey in the AFLW with a decision regarding her future there set to be made with manager Alan McConnell over the coming weeks. Staunton is plying her trade at GWS alongside Donegal star Yvonne Bonner, with her former Mayo team-mate Sarah Rowe, Tipperary’s Aisling McCarthy and Clare’s Ailish Considine also lining out in the 2018 league. Email “'My Mayo days are done,' says Staunton as decision to be made on AFLW future”. Feedback on “'My Mayo days are done,' says Staunton as decision to be made on AFLW future”.